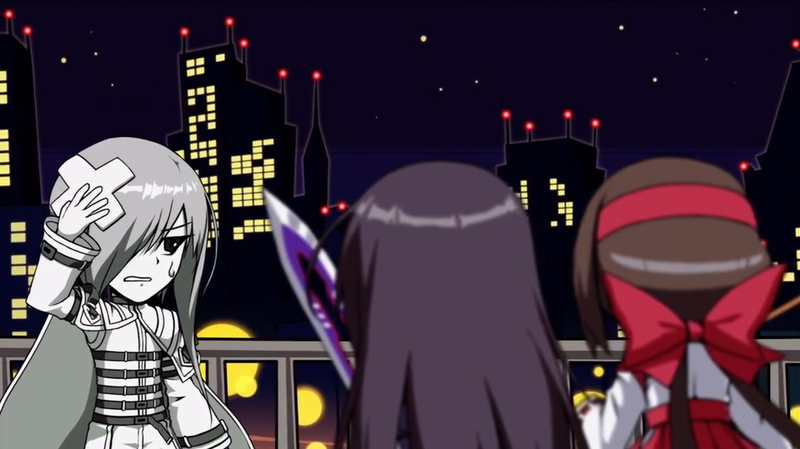 ← Galge Review – Baka Moe Heart ni Ai wo Komete! Since this game embraces the retro-style so diligently, let’s respect it and see what we can make of the story just by seeing the dialog-deprived intro, shall we? It seems about right to me…Ok! Since they “break the retro-spell” by putting actual dialog and narrated explanation right at the beginning of the first stage, I could understand that this is a direct sequel to the first game. There is a mysterious entity known as “Phantom” who is currently sealed on another dimension, but he found a breach on the seal which let him share his powers with people from our world. Now there are those who conspire to free Phantom, while others try to stop this. 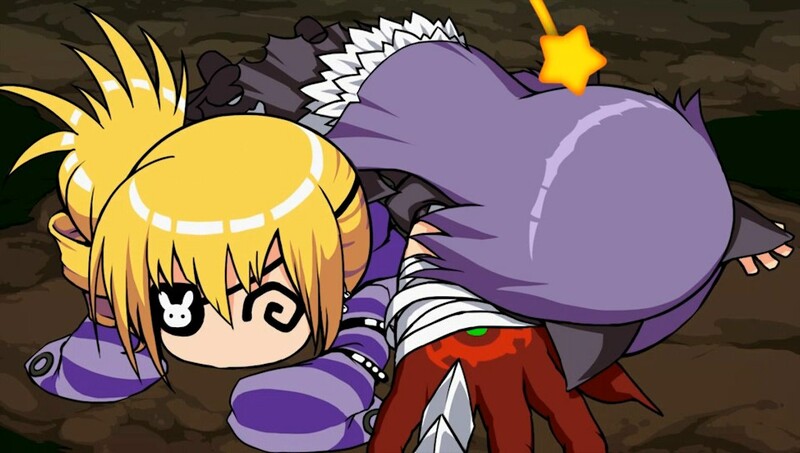 Little matters for Phantom, since the seal wears-off each time people use his powers to fight each other, so it was only a matter of time…Ah! 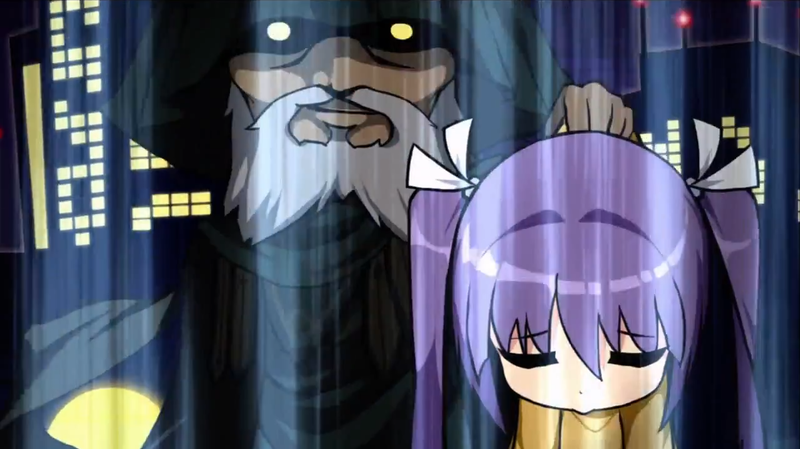 And the loli from the intro is the Miko’s imouto and she was kidnaped because it is a good plot-device! The cast still the same from the original but with some characters missing and the imouto character who I believe wasn’t on the fighting game. The characters personalities and designs still too simplistic. 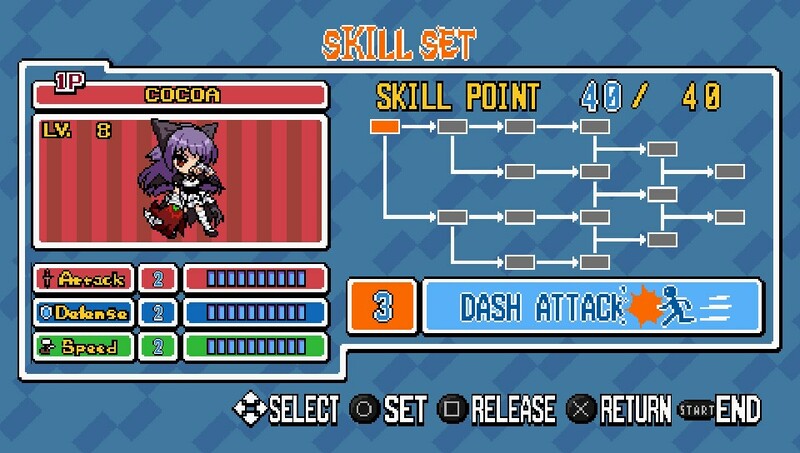 I like to compare this game with Arcana Heart, another fighting game featuring only girls representing fetishes. I can’t say Arcana Heart characters are much better personality wise, but that game at least was able to use those clichés on a more unique way. 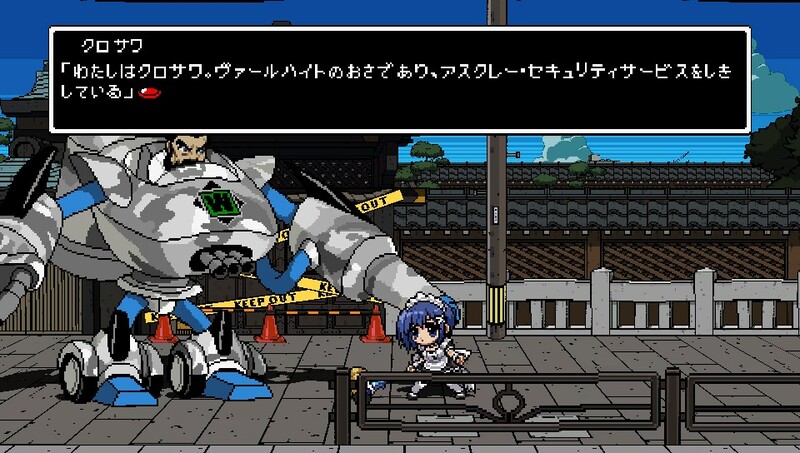 For example: While the Maid from PB wields a hammer like it was a broom, AH meido uses a buster sword and wears a heavy armor! 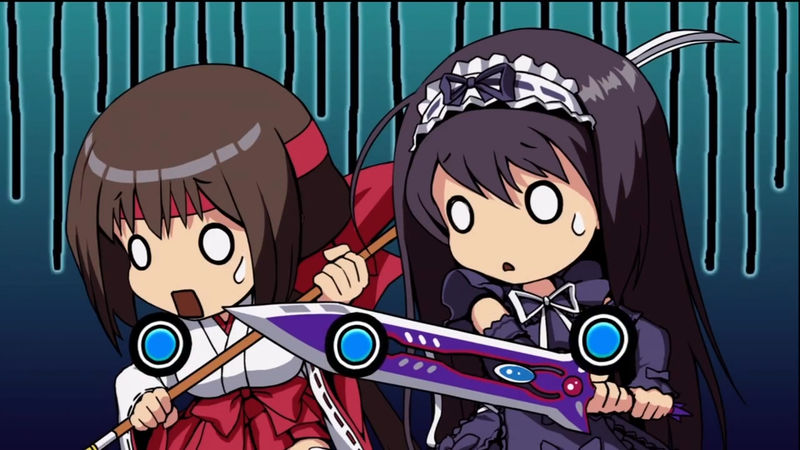 While the Miko from Phantom Breaker uses a Naginata, the Miko from AH is equipped with a freaking bay-blade and fights along with his sisters who ride giant jet origamis! Anyway! 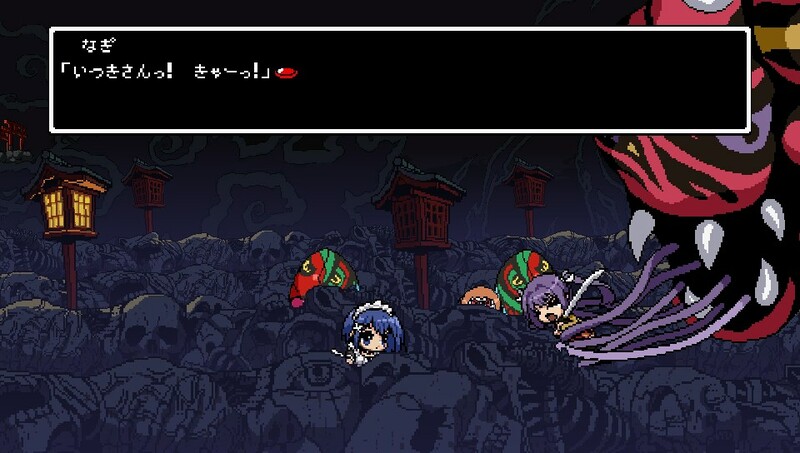 The designs didn’t change a bit and since there was no character development on the last game, the heroines continue to act just the way you would imagine they would just by seeing a still shot of them. 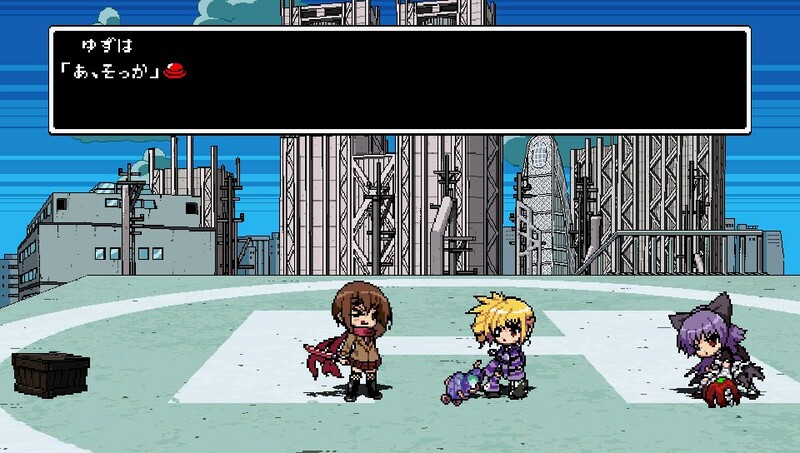 I will start by saying I don’t like the original Phantom Breaker. It has poorly animated graphics with uninspiring special moves and a battle system that didn’t bring anything new to the table with awkward controls. 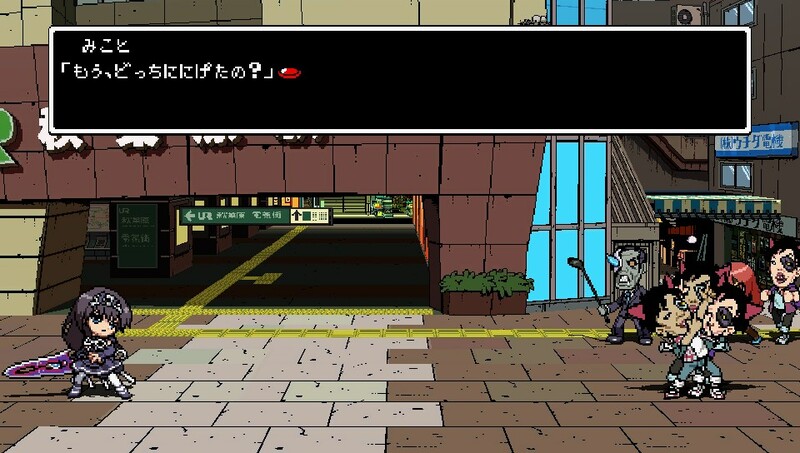 However, this game feels very different, and it’s no wonder, since the genre shifted to a Beat ’em up. 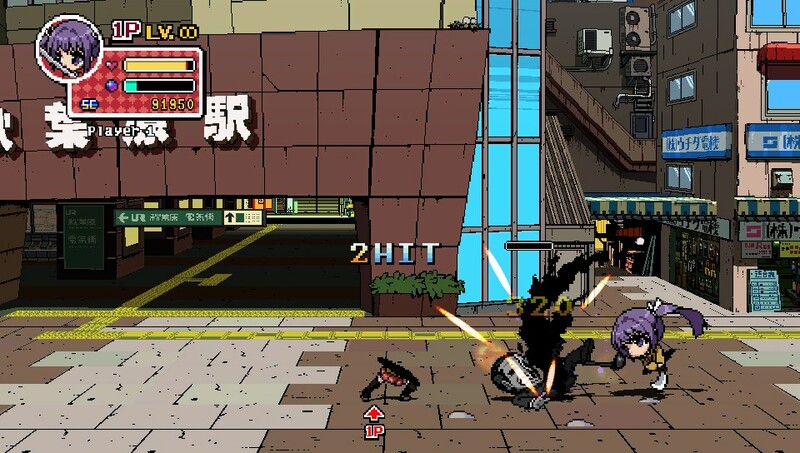 While it doesn’t really innovate at this genre as well, at least it got a certain charm and the gameplay improved quite a lot, with fast-paced action and precise controls. 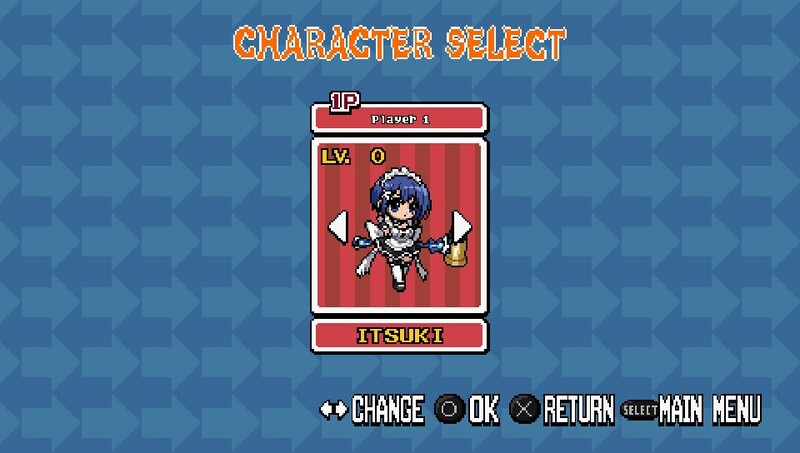 Each character has a distinct feel, with their own set of special moves and different attributes. You start at stage 0, which gives you a little taste of what you can become in the future. 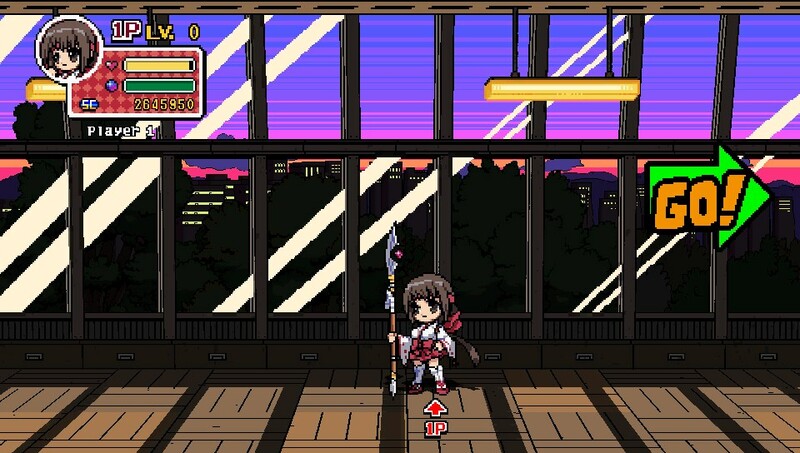 At this point, it’s pretty normal for most heroines to make combos of over 10 hits just by pressing square repeatedly. They also have many crowd-control moves with X+directional pad and a screen-cleaning move on R. However, on a Super-Metroid fashion, you lose everything at the end of this stage. You can level up you character by collecting red crystals through the stage. Each level gives you an amount of skill points that you can spend to buy new moves or upgrade your attributes. It’s nothing really new or balanced, but it is a surprisingly fun gameplay. The graphics are on a SD format and have HD quality, but they use a filter to make it look more “16-bitish” and there’s no way to turn this filter off. The animations are very decent, and there’s a good deal of frames for each movement, being much more well-animated than it’s predecessor and even the old special moves look cooler now. There is a good variety of enemies and few cases of color-swap. There’s no moving objects or by-standers on the background, but at least they are full of little details and variations. Totally betraying the old-era style, there’s plenty of voices, not that I am complain about that, I actually am glad to have something to hear other than the BGMs, since they are not very appealing, just some 8 bit tracks. I don’t hate this style, I even am a fan of Anamanaguchi, but I was not captivated by what I got with this game. Ok! 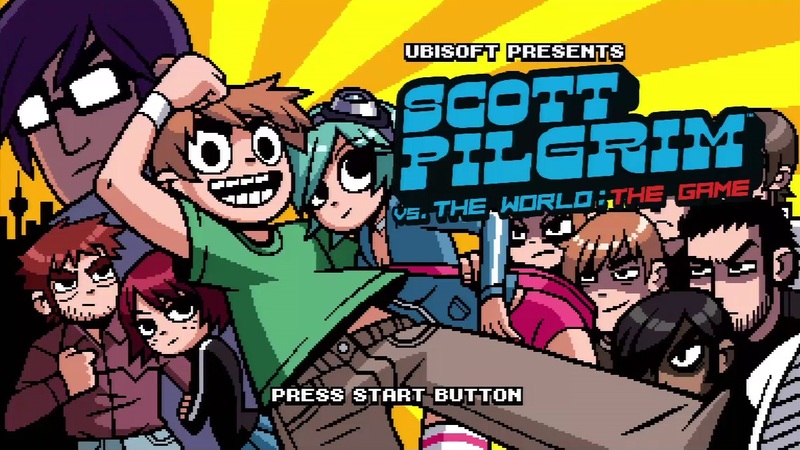 I know A LOT of people will call this the “Japanese Scott Pilgrim”, but aside for the SD retro-graphics, nothing in this game is quite like Scott Pilgrim, and maybe this is for the best! 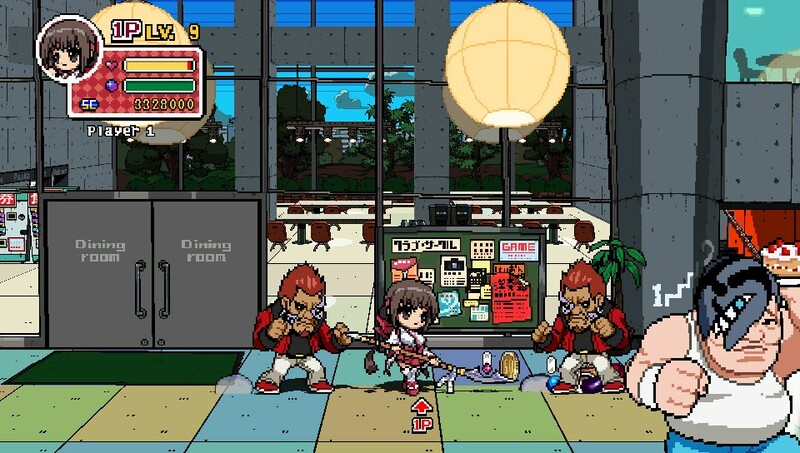 The game has little replayability, but making it portable was a great idea, since it can still be quite enjoyable to play it out of boredom when you’re waiting on a line or something, specially considering how cheap it is. 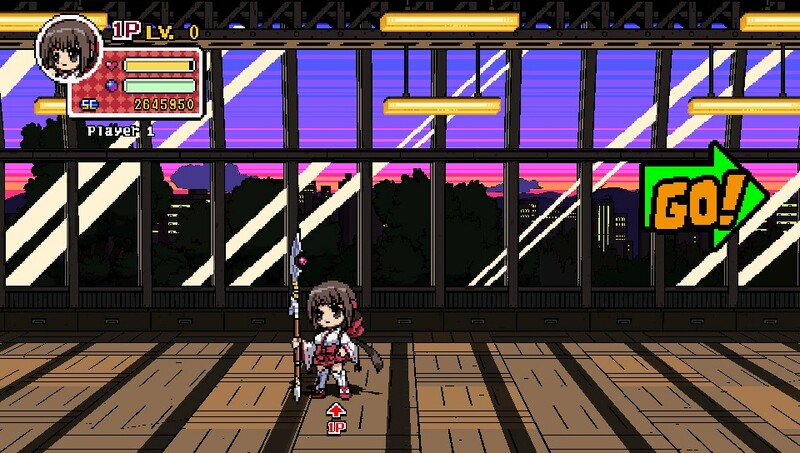 It is a nice choice for those who like cute anime girls, retro games, or Beat ’em up! This entry was posted in Game and tagged 5pb, Division2, Game, Mages, PS Vita, Review, XBox 360. Bookmark the permalink.